Tanah Datar regency is famous tourism place. It is located at lake-village, Guguak Malalo. One of them is Macau Duo which has beautiful view for visitor specially for me. It is new tourism place which be recently opened. Then it is location in hilltop where to walk to way of hilltop, we must go through climb up. To walk to way of there must traveled five kilometers. Then it can drive motorcycle, and car. It is used as baled out or which called paralayang. The first tourism place this Tanah Datar regency which used as paragliding. 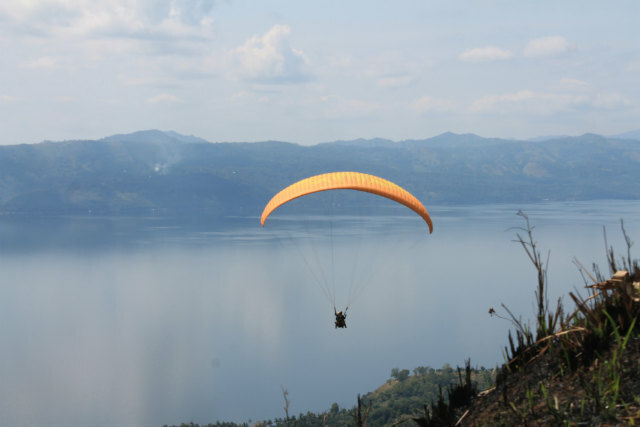 This object will be become as famous tourism place paragliding in West Sumatra. Therefore people want to develop tourism enthusiastically. It is seen by welcome mat society in opening ceremony Macau Duo. Besides it is as new tourism place, in addition it has beautiful of nature. Macau Duo has gift of nature beautifully. After that travel through way to there, we look at beautiful view where seen hilly, foliage, wet rice field and many more. Actually, it describes vast expanse of nature, cool weather, cool climate until we can forget the problem life. Not only used paragliding but also beaty bewitchingly. In addition we stand on hilltop where become as take-off baled out, we look at Singkarak lake utterly, the view of hilly, and trees. Therefore many paragliding players have been done paragliding . One of them said that we look at panoramic sight in West Sumatra than other places. Then it is truly wonderful, when we keep in sight nature highly like lake, hill and many others. So that it is gift of nature given by God. Besides Macau Duo has beaty of nature, society support in increasing this tourism. Society in development are very enthusiastical. It is looked in washing up landing paragliding. Where as landing locate at the site near ashore Singkarak lake which located in Talago Lintah village, Guguak Malalo, Batipuh Selatan subdistrict. Society hope this tourism to be developed to bend over backwards for increasing this area. So that for visitors want paragliding, you can come to Macau Duo located at Guguak Malalo, Batipuh Selatan, Tanah Datar regency.